SWIRC’s programs touch thousands of lives on the Southwest' reservations. Your donation will make a difference in the lives of families like this one. 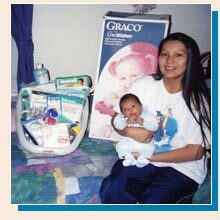 The Southwest Indian Relief Council (SWIRC) depends on the generosity of private donors to fund our programs that benefit Native Americans throughout the Northern Plains. SWIRC receives no funding from the US Government or grants. Your donations allow SWIRC to provide vital support for thousands of Native American Elderly, children, and families through our Program Services done in partnership with hundreds of Program Partners living in Reservations communities (for more information on SWIRC programming, please see the Programs link on this site). Thanks to the kindness of people just like you, SWIRC’s programs touches the lives of thousands Native Americans living in the Southwest every year. Many of our donors are concerned with preserving the future for Native American people by including SWIRC in their estate planning. If you are interested in including SWIRC in your Will please contact our Planned Giving Department at (877) 853-6474 and they will be able to provide you with any information you may need. Many companies have matching gift programs set up to encourage their employees to donate to charities. If your company has a matching gift program you can double or even triple your donation to SWIRC. If you have any questions, our Donor Relations Department will be happy to assist you with your company’s Matching Gift program. Please contact our Donor Relations Department at (866) 228-0124. If you would like to make a monetary donation to support SWIRC’s efforts to provide vital Program Services, by credit card, you can do this online by clicking below, or you can call our Donor Relations Department at (866) 228-0124 and they will be happy to assist you. For more information on donating items such as new toys, clothing, school supplies, or other needed items, please call Donor Relations (866) 228-0124.